The first oceanographic observations of mesoscale eddies were made in the 1930’s by Columbus Iselin and colleagues during quarterly Montauk-to-Bermuda cruises (Cullen 2005). When successive sections through the Gulf Stream revealed what appeared to be multiple crossings of the Stream, Iselin suggested that these features were solitary internal waves. These peculiar rotating currents were later identified to be mesoscale eddies, but only after the advent of smoked-glass-slide bathythermographs and loran navigation systems. 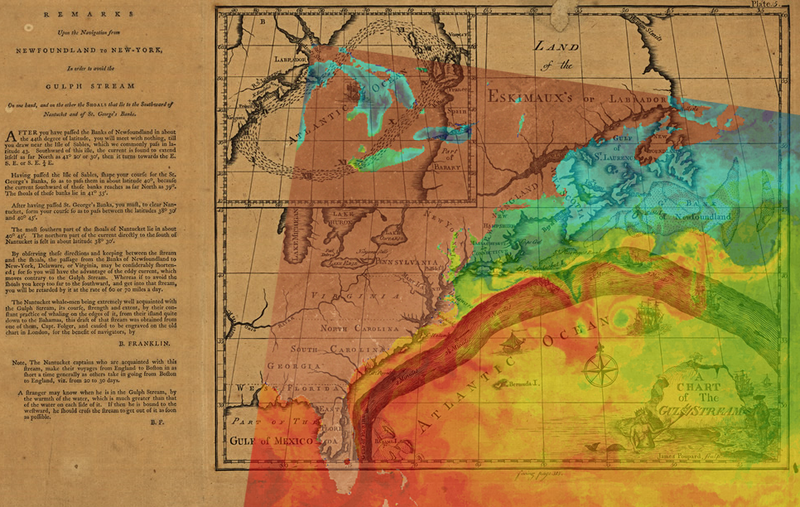 Both tools, developed during World War II, allowed for the collection of temperature profiles and the determination of a ship location to within 1 km, two essential elements for diagnosing the mesoscale structure of the Gulf Stream. The first intentional measurements of an eddy were made during the 10-day occupation of a cold-core, cyclonic Gulf Stream ring in the 1940’s (Iselin & Fuglister 1948). It wasn’t until the mid-1960’s that the first study dedicated solely to the dynamics of these eddies was completed (Fuglister 1972), marking the beginning of the scientific investigation of mesoscale meanders and eddies. Studies aimed at observing the influence of mesoscale eddies on marine ecosystems began late in the last century (1976-1977). Early observations of bio/physical interactions within eddies were limited to in situ measurements made by sea-going oceanographers. These oceanographic research voyages yielded fascinating observations of the relationship between eddies and phytoplankton, zooplankton, nekton or fishes. This sparked considerable interest in the influence of mesoscale eddies on organisms in the ocean (an interesting review of early observations made in the Gulf Stream was published by the “Ring Group” (Backus et al. 1981)). These early observations were limited to relatively short occupation of just a few eddies. Today, eddies can be observed from satellites, which provide global coverage at near weekly intervals. The sea surface height (SSH) signatures of eddies can be measured by satellite altimeters (see animation below), which were first developed in the 1960’s. SSH measurements from a single satellite altimeter are not sufficient, however, to resolve the ~ 200 km diameters of mesoscale eddies. The low-resolution maps of SSH constructed from a single satellite altimeter lead to the interpretation of westward propagating SSH anomalies as linear Rossby waves (Chelton & Schlax 1996). Careful investigation of the observed westward propagation speed of these features revealed inconsistencies with the theoretical phase speed of Rossby waves. In the early 2000’s two SSH measurements from simultaneously operating altimeters (10-day and 35-day exact repeat orbit) were merged into objectively mapped SSH fields. It became evident that these westward propagating features were nonlinear mesoscale eddies rather than Rossby waves (Chelton et al. 2007, Chelton et al. 2011b). 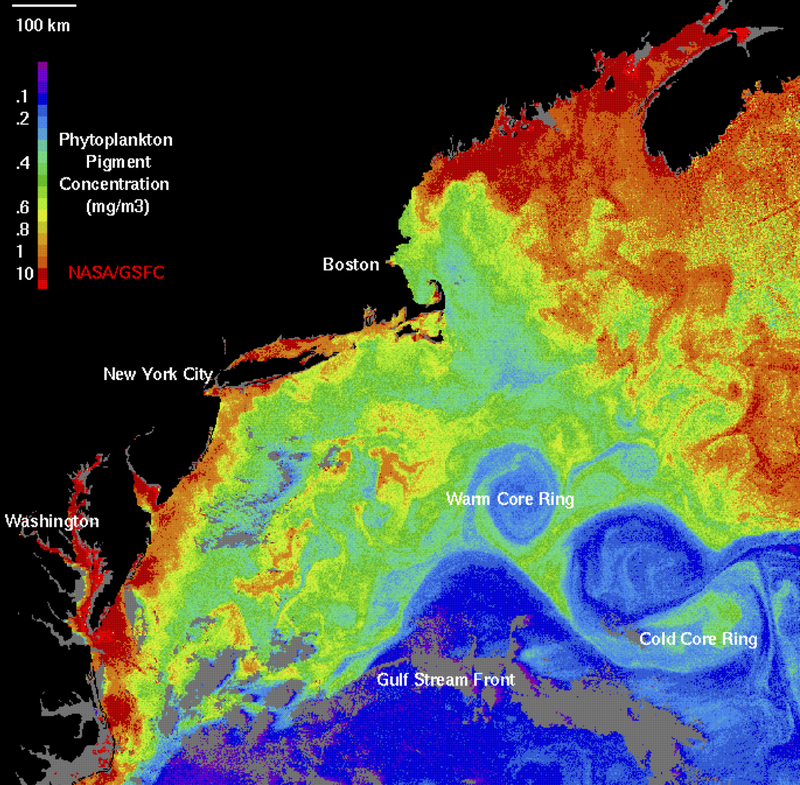 The profound impact of eddies and meanders on marine phytoplankton became apparent with the 1978 launch of the Coastal Zone Color Scanner (CZCS), one of eight instruments flown aboard the Nimbus-7 satellite (Figure 2, Hovis 1980, Abbott & Zion 1985). This early proof-of-concept mission operated intermittently for 91 months and led the way for follow-on missions, resulting in the rich archive of bio-optical observations from the visible portion of the electromagnetic spectrum available today. Near-surface CHL image estimated from measurements of ocean color made by the SeaWiFS sensor. Image courtesy of NASA. It is now common knowledge that eddies are ubiquitous features of the World Ocean. Recent investigations of SSH signatures of eddies revealed that most of the eddies in the midlatitudes are nonlinear, containing a region of trapped fluid within their interiors (Chelton et al. 2011b). Moreover, westward co-propagating SSH and chlorophyll anomalies previously attributed to linear Rossby waves have been shown to be attributable to nonlinear mesoscale eddies, laying to rest the much debated influence of Rossby wave on near-surface chlorophyll (Chelton et al. 2011a). The work presented in Peter Gaube’s Ph.D thesis explores the signatures of mesoscale eddies in the wealth of satellite observations available to the modern-day oceanographic community. By guiding our research with altimetrically derived eddy trajectories, we collocate numerous other data sets (both satellite and in situ) to the interiors of mesoscale eddies, allowing the first truly global investigation of the influence of mesoscale eddies on near-surface temperature, phytoplankton and on surface wind stress.